The debate over whether a value or a growth style produces better long term investment returns continues, with staunch advocates on both sides. Certain high profile investors such as Warren Buffett continue to champion the Benjamin Graham school of value investing while, in contrast, recent BAML fund managers’ surveys have shown the higher P/E ratio FANG stocks to be one of the most favoured trades. Below we analyse what could be driving performance divergence. In particular, was Jeremy Grantham right when he said that the value style has a hard time ahead? Or is growth’s recent outperformance about to fade? Throughout most of the 20th century, value stocks outperformed growth stocks. The total return on a buy-and-hold investment in 1927 in large cap value stocks would be superior to an investment in large cap growth. Taking the whole period together, though, is somewhat misleading, as value returns have not always dominated. 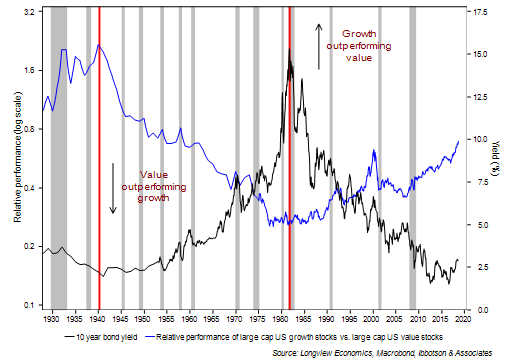 Between 1927 and 1940, and from the early 1980s up to the present day (except for during the last economic cycle) growth shares tended to outperform value. Whilst clearly this number of data points/turning points is insufficient to draw any robust conclusions (statistically), theoretically it makes sense that growth outperforms in a period of falling interest rates. Growth stocks tend to be valued using long term discount factors. Falling bond yields should therefore support an upward re-rating of the valuations of growth stocks. Conversely rising bond yields should undermine those valuations. Equally rising bond yields are also often/typically accompanied by rising inflation. Value stocks are usually dividend plays with those value companies often themselves endogenous in the inflation process (e.g. utility companies, food producers, staples) and, as such, able to protect earnings growth and dividends in a rising bond yield environment (and therefore outperform). Also of note in this debate is the dominance of the technology sector in recent years (i.e. in driving growth). 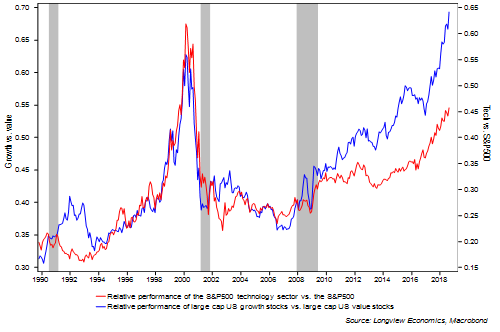 Since the late 1980s, when our sector data began, the relative performance of growth vs. value has largely tracked the relative performance of the S&P500 technology sector vs. the broader S&P500 index (fig 2). In that period of time the weight of the technology sector within the broader market has grown from ~7% to ~25%. As such, going forward the relative performance of value and growth is likely to continue to be dominated (in the near term) by the performance of US technology as well as by the medium term outlook for the US 10 year bond yield. As it stands, we view bonds as attractive at current levels (i.e. yields should fall in the near term). In the longer term (perhaps after the next cyclical bear market and at the start of the next bull), we would anticipate renewed weakening of bond prices (i.e. yields to move higher) and a continuation of the secular bond bear market which we anticipate likely began in the middle of 2016. For full analysis of the end of the secular bull market in bonds during July 2016 see Longview Letter no. 105, 24th November 2016: “Bond Yields: Are the generational lows in?”. For a copy of either of the pieces referenced in this blog please email ‘info@longvieweconomics.com’.